Taking the bus with my toddler. This morning the wee boy woke up at sunrise (again), but rather than play trains and make breakfast, we walked up to Breadworks and shared a bagel. 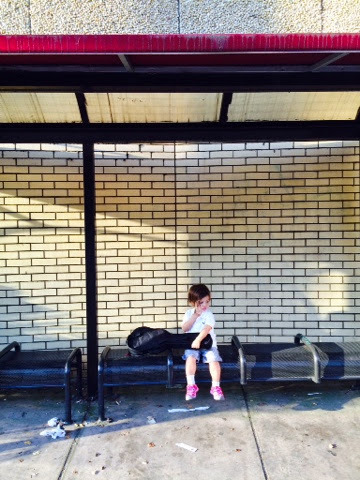 Then we -- and this is very strange for a Highlands-living mama -- TOOK THE BUS TO PRESCHOOL. Like not a yellow schoolbus, but a straight-up publicly-funded TARC bus. The Wee Boy LOVES taking the bus. He announced to everyone in Breadworks, "Bye-bye, friends. We're going to the bus stop," and off we went. We hopped on, he climbed on my lap, and then proceeded to sing, "The wheels on huge bus go round and round round and round round and round..."
By the second verse, a few other passengers had joined in. I dropped him off at preschool, and immediately hopped back on a bus going to Mama's Hip. It took all of three minutes to get there because apparently TARCs travel at warp speed. Pretty good investment for $1.75. 1. Ditch the stroller. Babywear if you need to. Or at least bring just a small umbrella stroller. It's way easier to move around. 2. Always carry exact change. 4. The driver doesn't actually say, "Move on back!" Prepare for disappointment. I wasn't able to post yesterday, but don't worry, I did spend the day celebrating Elvis Costello's 60th birthday. Mostly, I celebrated by doing something I haven't done in an embarrassingly long time: I listened to music. I don't know if it's a cause or a symptom of my postpartum depression, but I just have had no desire in a terribly long time to listen to music. Instead, my phone is loaded with audiobooks, podcasts, and talk radio. Rather than sit down and rock out, I've been reading whenever I had a free minute. This is partly because when I'm lying down with the Wee Boy, pretending to be asleep, I am able to sneak an earbud in and "read" a book. Why not music? I don't know. And it's sad. But yesterday ... and today too, while I was catching up on housework and mowing the lawn, I listened to Elvis song after Elvis song. And it was so so good. I'd been in a prose-writing mood for years, and maybe that's just because I was listening to words, not music. Suddenly, I'm feeling like playing music again. Upswing, perhaps? Thanks, Elvis, my friend. I needed it. I hereby throw my support to the YESSERS! I know, I know, I try to keep politics out of my blog, and my English friends will hate me for this, but I'm hereby officially proclaiming myself as a YES supporter. That might just balance out JK Rowling's influence to the NO campaign (we can still be friends, Jo!). This may come across as flippant, but I actually really am pretty excited about the prospect of Scottish independence -- and that's not just because I like Outlander. 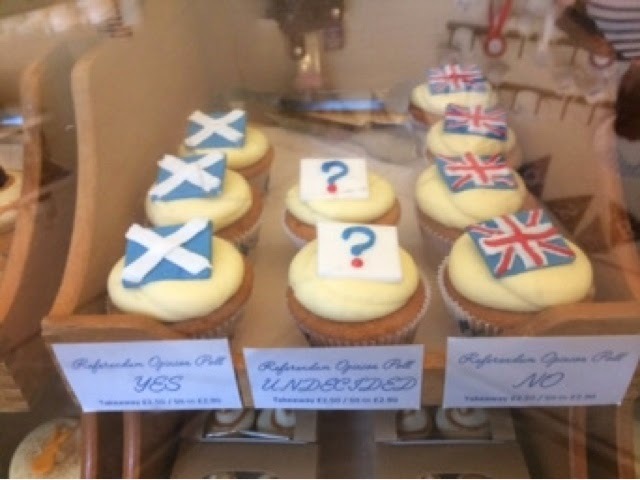 It also seems that, though my friends and I rarely spoke of politics while I was living in Edinburgh, pretty much all of my friends there are Yessers (is that a term? If not, bear with me ... i like "yesser" as a noun). I can tell this by the giant blue "YES" that has come to mark all of their Facebook profile pictures. And so to my friends in Scotland: enlighten us! Is there an excitement in the air? A nervousness? Are pubs harkening back to the days of the Enlightenment? Philosophical discussions over chips and a pint? Or are you just going about your daily business as usual? Also, please provide some talking points so I can convince my Loyalist husband that Scotland would be just fine on its own. Truthfully, I think he just wants the United Kingdom intact so that the Wee Boy can marry Prince George someday, and David can play polo with Wills while Kate and I go get our hair blown out. I want independence, so the Wee Boy can get a Scottish passport and we can all come back and give our tax money to the country that took such great care of us during my pregnancy. Although a nice blowout would be good too. I guess it's a win/win for us. Online Moms' Groups and the Drama that ensues: on finding your own filter. This week it's been a lot of upset women posting about how they feel marginalized and picked-on when X posts about Y. Think think think before you type. Backspace is your friend. An example: formula-feeding mothers commenting that they feel sad and judged because of all the recent support for breastfeeding mothers during the nursing-in-public debates. On one hand, I find this bizarre considering it's exclusively-breastfeeding mothers who are in the minority in America, at least by the time the babes are 6 months old (and hence why there's been rallying to support nursing moms). The thing is ... there are so many topics that are triggers for us. That's the problem with social media, right? Just because I get upset when you post about your baby's or your parenting successes doesn't mean that you are doing anything wrong. But people do get upset -- I do get upset. Horribly. I've even hidden some of my very good friends on Facebook because they posted things like, "My baby has been sleeping through the night since she was 4 months old, and last night she was up twice. I'm soooooooo tired!!!" Yes, a simple post like that used to send me into a sobbing rage of jealousy and ire and feeling of massive failure (and occasionally still does, despite my knowing better). It made me feel bad about myself. It made me feel guilty for feeling angry about someone else's success. It made me upset because, well, it wasn't actually making me feel anything -- I brought that upon myself. You see, my head knows that the woman who posted that genuinely did feel awful and truly was soooooooo tired when her baby stopped sleeping through the night, even if the emotionally-immature part of me wanted to roll my eyes and say you have no idea! See? It's not healthy. My sleep-deprived Mommy-brain is irrational. I don't like it. It makes me sad, and it makes me mean. I have to force myself to think before I type. I guess what I'm saying is there each one of us has our triumphs and our successes. And when we post about our triumphs, yes, we are probably making someone out there feel bad. But does that mean we should stop posting completely? Does it mean we should eliminate the support groups? I don't have a solution, but I am trying really hard to use a filter when I read people's posts. I use the delete key a lot. I don't want to be the annoying person who comments, "Just you wait!" or "You have no idea what tired is!" or "Stop bragging because you're making the rest of us feel bad." I want to be a better person than that, even though it is admittedly my first instinct. I want to try to see everything from other people's points of view and try to see each person's call for help. Of course, that's a lot easier to say that than to behave rationally when you type faster than you think. It's not about breastfeeding mothers making formula mothers feel bad. It's not about I'm-more-tired-than-you-are. It's not about organic food or disposable diapers or un-schooling or co-sleeping. It's about support, right? First ask yourself if it's truly the fault of the group -- or if maybe it's just the filter through which you're seeing things. As far as I can tell, everyone out there is just trying to do they best they can for their family. No one is doing anything at you -- sorry to say, it's not usually about you at all. People make individual choices, and most people think their choices are good ones or they wouldn't be doing them. If the group members aren't supportive, or if you aren't mentally in a place to accept differences in parenting, leave them and find some place where you feel safe. Sounds easy, right? I just hope I can follow my own advice the next time X posts about Y, and I start to cry. 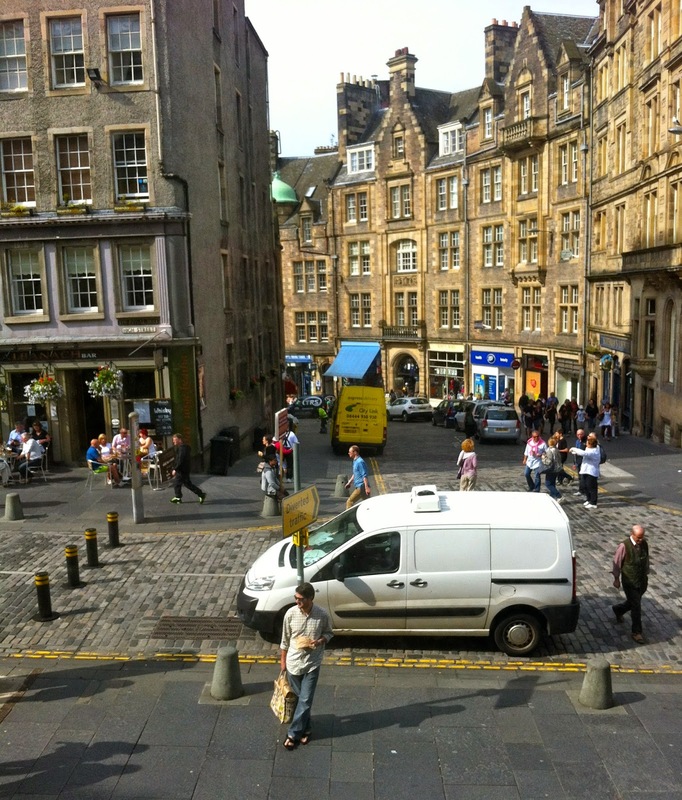 The Diagacross: Pedestrian signals in Edinburgh. I don't have a single favorite thing about Edinburgh. Anyone who knows me knows that I have a lot of favorite -- or shall I say favourite -- things about the city. But a strong contender is the diagacross™. husband just casually waiting for me in front of that van. At most traffic junctions in town, there is not just a small interval of time in which a little green man* flashes and signals the pedestrian right-of-way to cross from two of the corners. There is actually an entire segment of time where all the cars are stopped! This means every single pedestrian can cross at the same time ... it also means you can cross diagonally during one signal. Meanwhile in Louisville, the little white man* doesn't even appear in my neighborhood unless you actually arrive on foot in time to push the button. This means you often wait through an entire cycle before getting the little sign that it's your turn to cross. Grrrrr! Me and my whining about pedestrian troubles in this city. Anyway, just daydreaming about diagacrossing this afternoon. *Can I also whinge about why our signal is a "white man" not a "green man"? I'm trying to teach my kiddo to say "little man" rather than screaming "WHITE MAN!" when it's finally our turn to cross. It's not really a thing you want your toddler just shouting. The things I learn from this blog and my friends! Adventures in night-weaning. Books and Alarm clocks. 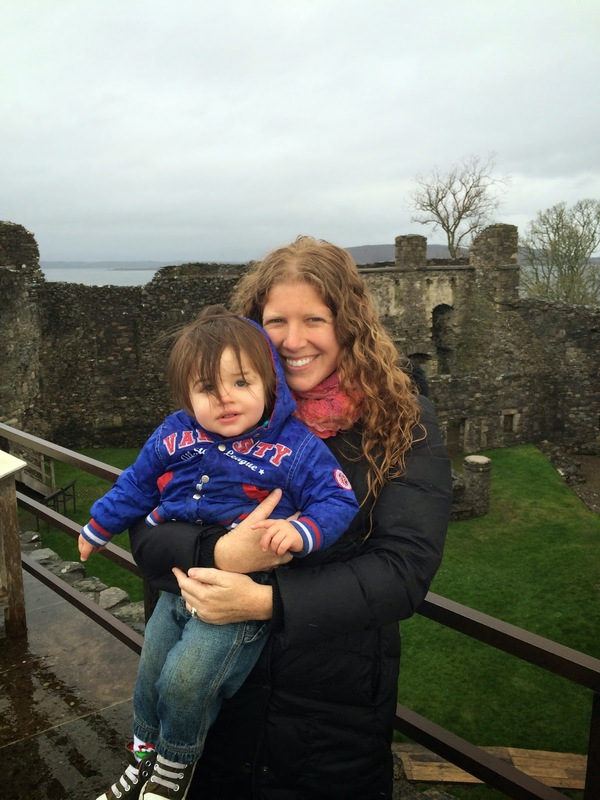 One magical night in Oban, Scotland, the wee boy slept. Well, he only woke once, gave a huge scream, and promptly passed out again. Ah, Oban... we'll always have Oban. He's never been a good sleeper. I've stopped complaining about that; it's much easier to deal with when I expect it, rather than hoping "tonight's the night!" and being disappointed. The crib has always been a battle, and we finally relented to co-sleeping/bedsharing. He sleeps with us now, and it is so much better. When I don't have to get out of bed to go to him, I am able to get more sleep myself. It's better that way. We're safe, I assure you, and we get the very best cuddles you could imagine. Also, please don't offer suggestions on getting him to sleep. At this point, the suggestions just frustrate me, which I'm sure is my own hangup, but let's just not go there, okay? We read eleven sleep books and have tried everything. New methods give me false hope, then make me feel like a failure. I'm over it. And happy with things the way they are ... for the most part. What I'm over is the night nursing. You see, I've started to get nursing agitation, which basically feels like a gazillion creepy crawlies are under my skin. It only happens when he nurses at night for some reason, and I can no longer deal with it. And so it is time to night wean. 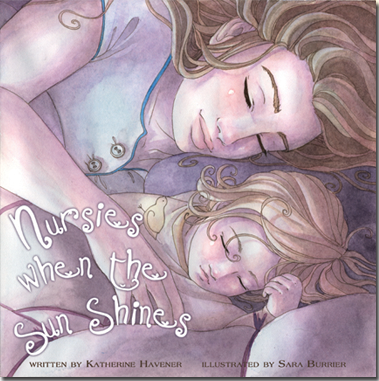 A wonderful lactation consultant recommended a book called Nursies When the Sun Shines. The wee boy loooooves this book, which we read for about two months before deciding he was ready to implement the "Nursies when the sun shines" rule. It's a cute book that talks about how "nursies" go to sleep when it's dark out the window, and they wake up when the sun is out the window. Easy enough for a toddler to understand, right? The wee boy picked up on it right away, fussed and still sometimes cries out for nursies all super sad-like in the night, but generally will go back to sleep after cuddles and pats. Until the sun creeps up. Last week I got him this alarm clock that turns green at a certain time because I can't stand the 5:30a, "Mommy, the sun is rising, mommy it's nursie time!" 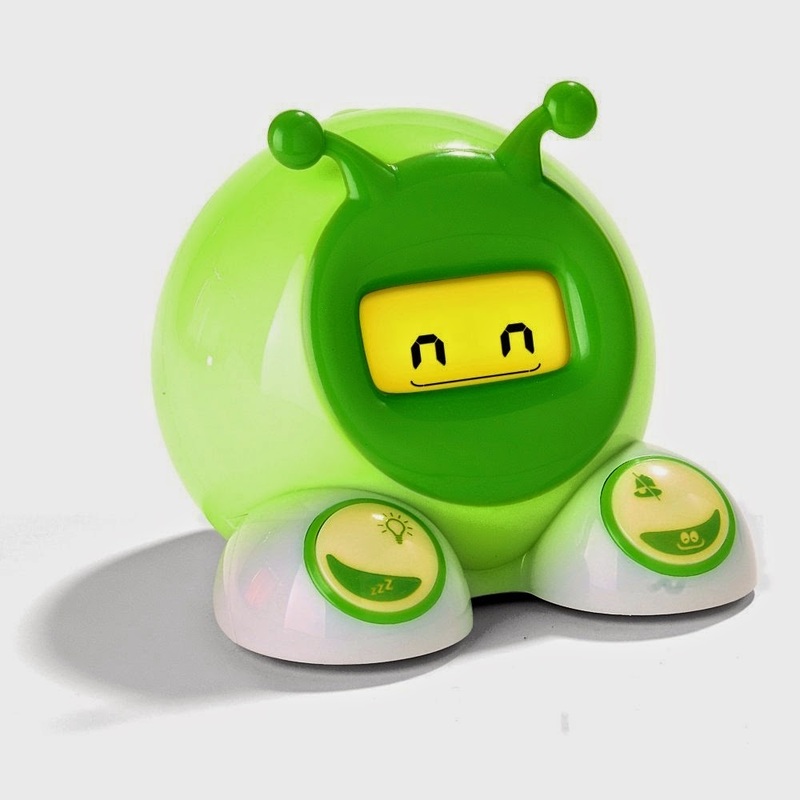 Now he at least knows to wait until his alarm turns green, and he gets sooooooo happy when it is green. ("Mommy mommy it's geen! May I have nursies now please?" Swoon, how could anyone refuse??) I'm hoping to slowly push the wakeup time back, but right now, he's still waking up and whining every day by 6a. Which, I suppose, is better than 5. Look how happy I am. This was taken the day after Oban. Ahhhhh, Oban. I should look into real estate in Oban. PGA excitement and lots of pictures. The PGA is in Louisville this year. We bought tickets back in 1994, or at least that's what it feels like, and now so many friends and family have descended upon our house to go to golf festivities. It's kind of a blast. We have a house full of friends which, however much my introvert soul gets a nice fill of anxiety, is ultimately pretty fun. A few people ended up not coming to town, so we also have some extra tickets, which we tried to sell, then give away. Apparently everyone in Louisville has extra golf tickets. Who knew? Yesterday we took the fancy coach service from Churchill Downs to Valhalla and walked around. The security people pre-bus were disorganized and mean, but once we got past them, all was well. I have to tell you that I don't actually like golf. I'm pretty sure it's the most boring thing ever, and I feel guilty, as a Scot-o-phile, saying such things. Why is it a spectator sport anyway? Isn't The Golf Channel as boring as, say, The Yoga Channel? Actually, the Yoga channel would probably be more interesting because you'd get contortionists and falls. But anyway ... wandering around Valhalla was surprisingly pretty fun, but it mostly felt like a weird walk in the park. But as with anything, it's not where you are, but who you're with (excepting Paris). The company was grand! Houseguests galore! What to do about food? We have a full house this week, so I'm not sure how much time I'll have to write. Apparently, the PGA is a big deal to a lot of people we know and love. Though I don't care about golf unless I'm in Scotland (and that's only because you can see a castle from St. Andrews, plus that's where Kate and Wills met, so it's, like, of big-time historical significance), having the PGA in Louisville this year means we get a visit from the in-laws AND my best friend in Austin, Texas. It's going to be a packed house, full of Texans, and lots and lots of fun. We let ourselves get so hungry that we had no option but to go out. I tried to go to the store to at least make sure we have snacks available, but I'm still afraid for our pocketbooks this week. I'll keep you posted, and I will, I hope, have a thoughtful blog about how to have houseguests without breaking the bank on food. It's challenging because we have vegetarians, meatatarians, a pregnant woman, and more. 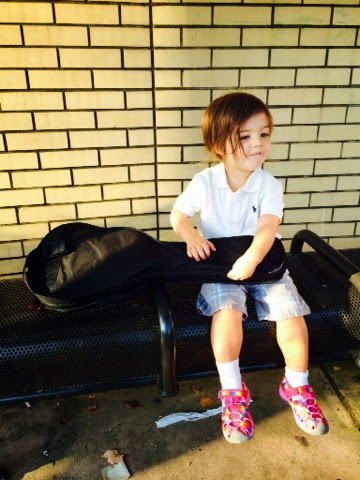 In music news, my parent/child music classes have been just so packed and fun-filled lately. Thank you all for coming. Next week's Family Music Jam at Mama's Hip on Tuesday, August 12 at 9:30 am and again at 10:30am. BUT beginning the following week, we're switching the Music Jam to Wednesday mornings, so please make note if you're a regular. I know some people will probably be upset by the change ... hoping many more people will be excited. I apologize if this messes with your schedule! I teach at a preschool on Tuesday mornings during the schoolyear, however, so it's unavoidable. Tuesday, August 12th's music jam theme is: TEXAS. Yep. Some of our favorite toddlers are moving to Texas, so I'm planning a bunch of Texas tunes to give them a proper send-off. Any song ideas? Weekend update and thoughts on Outlander. Hope everyone had a grand weekend! We definitely did ... got the chance to celebrate our anniversary thanks to a kind neighbor and kind grandparents, who babysat Friday and Saturday nights. We had our first lazy, hedonistic dinner in a loooooooong time. Maybe the first since we went to The Kitchin in Leith when I was 8 months pregnant? We followed a self-imposed no-cell-phone rule, so I didn't take any food photos this time. I did realize that it's impossible to follow the no-cell rule completely when you have a kid at home with a babysitter. My phone was in my purse next to me, and I looked at it every time I heard it vibrate. I guess what everyone said pre-kid was true: you'll never be able to truly relax again. But it was still a lovely time. Daddy reading to the wee boy. We spent Sunday at the neighborhood pool, which was perfectly pleasant and happy until some grouchy man who maybe was just having a really bad time in his life (I really should give the benefit of the doubt, right?) tried to pick a fight with me -- or shame me maybe? or I'm not really what his intent was, but it was really weird ... -- by getting upset with me that my kid was playing with his kid's toy and then acting like that was causing some other kid to cry when this dad took the toy away and put it back by his stuff, so no one else could play with it. Totally weird, and I was definitely taken aback (along with at least six other parents who witnessed the encounter and said this poor grumpy man was way out of line). I've been going to this pool for my entire life, and it's just common knowledge that toys in the kiddie pool are community until you need to go home. Or at least be nice about it if you don't want to share. Ooooh ooh! Last night we watched Outlander from starz.com. It's like anything when you've read the novels first. You have the characters in your head a certain way, and the actors are usually not in line with your imagination. Claire's hair wasn't curly enough (but I know Hollywood rules -- curly-haired women cannot have starring roles). Jamie wasn't tall enough. But Scotland was there in all its glory, and it's truly the scenery that's the star of this show. I don't know how this show will come off to people who haven't read the books, but I enjoyed it. I'm a sucker for time travel shows. So that's our weekend catch-up. Less personal and more interesting blogs to come this week: a nice granola bar recipe, perhaps a guest blog by Colleen on cooking for houseguests, and I still have to tell you the story of the missing Red Accordion. Maybe this week. In the mean time, we are preparing our house for an onslaught of houseguests coming in for the PGA. In-laws, friends, kids, it's going to be nuts. The Wee Boy's first Diving Board jump! The Wee Boy jumping (22 months) with a little help from Grandma. I wish I could just keep a running log of all the adorable things the Wee Boy has been doing and saying. Like this morning, I decided to make an effort and, like, wash my hair and put on a dress. Then he looks up at me and says, "Mommy! Your dress is beautiful." And then I melted a little bit, and he went on his merry way racing his bunny wheel and his popcorn wheel. Yesterday was diving boards day at swim lessons, as you've no doubt figured out, and after jumping in, he kicked up to the top, pushed the hair out of his face, and said, "I wanna jump off the diving boards again, Mommy-O!" And, of course, he did.